So gather your ingredients; get your chopsticks ready. 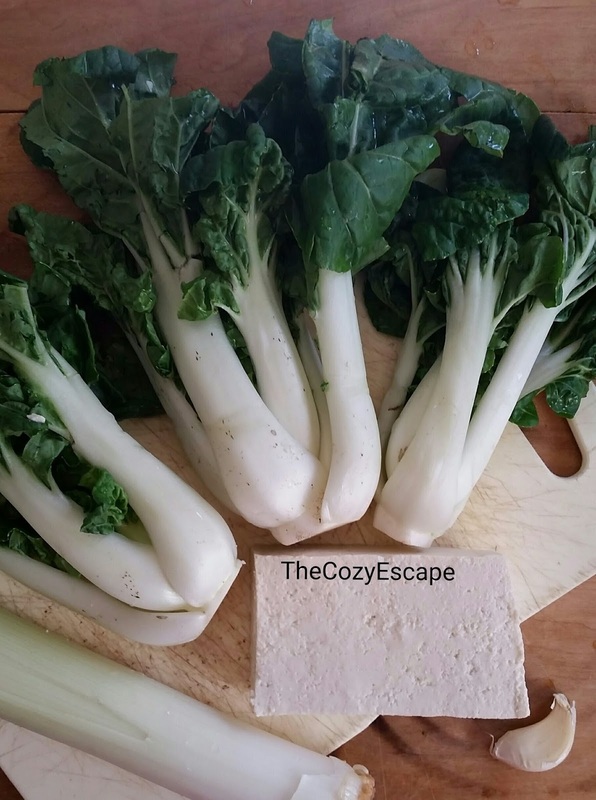 Here is my recipe for a Leek, Bok Choy, and Tofu Stir Fry! Coat the bottom of a non-stick frying pan with just enough olive oil to cover the whole bottom in order to prevent the tofu from sticking. Lightly wipe away any excess oil. Heat the olive oil on medium-low heat until hot. 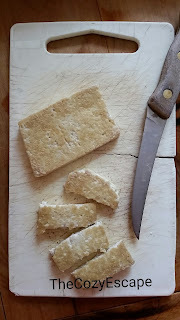 While you are waiting for the pan to heat, salt both sides of each tofu slice - just enough to lightly cover each surface. Test the oil's readiness by sprinkling a drizzle of water into the pan; if the water sizzles, the pan is ready! Slightly lower the heat, and then lay each tofu slice into the frying pan. When the bottom of the tofu reaches a rich golden color, flip them and fry the other side to the same color. Once both sides are golden and lightly crisped, remove the tofu from heat. 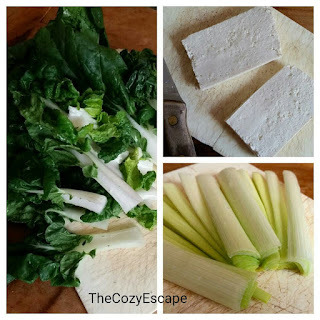 Cut the tofu slices into strips - be careful; they are hot! 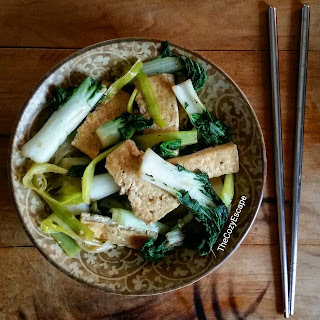 Put the leek slices and bok choy into the frying pan. Add 1/4 cup of water and cover with a lid. Steam the leek and bok choy for about 1 minute, or until slightly soft. Drain all excess water into the sink, keeping the vegetables in the pan. Stir the crushed garlic and ginger with the vegetables and simmer. When the garlic becomes fragrant (30 seconds or so), add the soy sauce and a sprinkle of pepper. If you like your food spicy, go ahead and include Sriracha or chili sauce. Add the tofu strips, toss all ingredients together, simmer for a few seconds just so that the flavors blend together, and serve hot. There may be a "sauce" left over in the pan; drizzle on some of the sauce for added flavor! Accompany the stir fry with some rice or soba noodles for a complete dish.